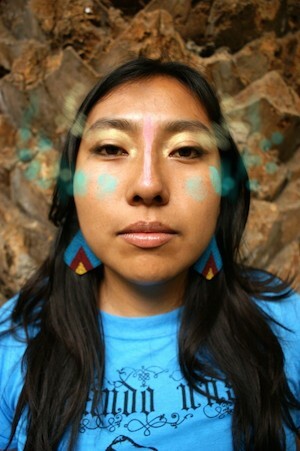 Speaking to Mare Advertencia Lírika, a Zapotec rap artist from Oaxaca, Mexico, and subject of the documentary “Cuando una mujer avanza” (2012), is a wonderful whirlwind of a vocabulary lesson; her carefully chosen words beautifully share complex ideas about origin, identity and rebellion. Mare is commenting by phone from her native state on how she became an instrumental and early force in the Oaxacan rap scene and how she came to the art of rapping as a means of constructing her identity. It is the story of a young woman finding her place between family tradition and personal modernity. As an urban child with indigenous Zapotec roots who loved poetry but had been told by a teacher she had no future as a poet, Mare found a path which united the power of language and the melody of rhyme. At the age of 16, in the early aughts, Mare joined the seminal OCG crew at a point in time when the city of Oaxaca was also developing a thriving graffiti scene. In 2004, Advertencia Lírika, a group founded by her and two other artists split off from OCG. Five years later, the other two artists withdrew from music, so Mare continued as a soloist, keeping the name of the group as her family name. Mare describes today’s rap scene in Oaxaca as intimately related to graffiti, engraving, stenciling and breakdancing. She also notes that it has gone through a stage where the state itself tried to control the scene’s naturally rebellious spirit, producing large events where topics and spaces were strictly defined. The authorities even took advantage of the information from registrants at those events to punish them if they graffitied in the city in forbidden zones or about forbidden topics. However, as of the 2006 protests, these arts along with son jarocho became important tools in the social uprising. Mare Advertencia Lírika will perform in Chicago as part of her USA tour on October 4 at Cultura in Pilsen. Feature photo by Visionary Mind. Check Catalina’s show Beat Latino (on Facebook, Itunes and online, airs Friday and Sunday on Vocalo) which recently included a special on Latinas in Hip Hop.